There are few better ways to get immersed in the culture of your school—and make friends on campus—than living in a dormitory. Making your dorm room feel like home costs money, but with a little ingenuity, it’s possible to turn a scant decorating budget into some fabulous digs. 1. SKIP THE FRAMES, GRAB THE CLOTHESPINS. One of the easiest ways to give your room a personal touch is to pack it with photographs of people and places you love. But frames can be pricey, and they also leave unsightly holes in the walls that can end up coming out of your deposit at the end of the year. Go the DIY route and buy a pack of wooden clothespins and some wire for a few bucks instead. 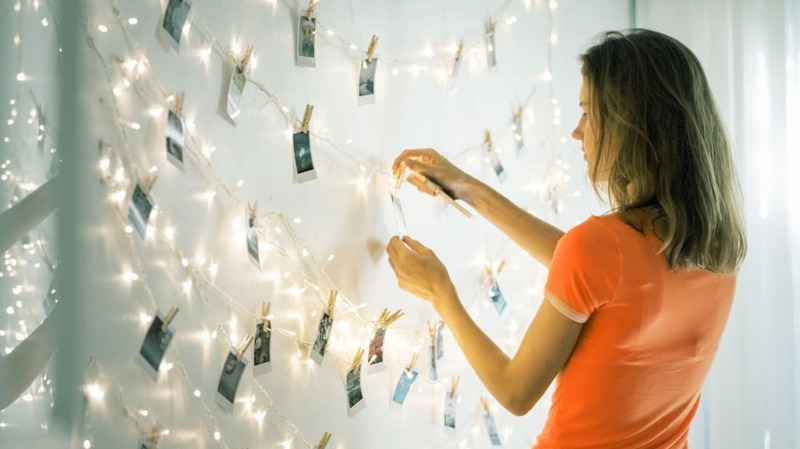 Hang the wire from one corner of your room to another and use the pins to clip photographs to it, creating a quirky piece that fills your whole wall with images that make you feel good. 2. ORGANIZE YOUR BOOKS BY COLOR. One great way to add a pop of color in your dorm room is by using your books. Divide your book collection by color and arrange the volumes so that they create a rainbow gradient running along your shelves, from red to yellow, yellow to green, etc. The finished product will give your shelving an eye-catching aesthetic that can really brighten a room. 3. UPCYCLE YOUR T-SHIRTS TO MAKE BEDDING. Moving out of your parents’ house is a good opportunity to purge your closet of all the old t-shirts you haven’t worn in years. Instead of throwing them out, save the ones you like and turn them into blankets or covers for your throw pillows. Shirts branded with your favorite sports teams, bands, or just colorful patterns all have potential. It’s a great way to give old bedding a playful new look while salvaging any worn-out shirts that hold nostalgic value. 4. DECORATE YOUR WALLS WITH PAINT SWATCHES. Paint swatches are free at many hardware stores, and they’re good for more than deciding on a paint shade. Ask your local hardware store for some extras, and apply them your walls with sticky tack to create a striking mosaic display. You can stick with a specific color palette or find as many swatches as you can to cover the entire spectrum. 5. LINE YOUR STORAGE CONTAINERS WITH WRAPPING PAPER. Clear plastic containers may be inexpensive, but they’re not the most fashionable storage option. Give yours a splash of color by lining them with patterned wrapping paper. Instead of looking at your clothes, all you (and your guests) will see is the pretty design. With budget friendly design tips like these, you can make the most of your new dorm room. With your Discover Student card, you can make the most of your cash back because they will automatically match all the cash back you’ve earned at the end of your first year as a card member, dollar for dollar. Learn more at Discover.